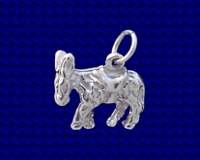 Sterling silver Donkey charm. Donkey rides have been an integral part of the British seaside holiday since the late 1800's. Blackpool Lancashire is perhaps the resort best known for its donkeys. In recent times there has been much concern for the well being of the working donkeys and their use is tightly regulated with licensing, health checks and weight limits. Retired animals are also looked after, with donkey sanctuaries operating in many areas.